All right, you know the deal by now, right? 3 pages, 1 page front cover, 1 page SRD/editorial, 1 page content, so let’s go! It should be noted that the SRD page contains a feat, so don’t miss that! -Engulf Horror: Non-mythic creatures are nauseated; for mythic power expenditure, the effect applies for 1 minute. -Engulf Revulsion: Creatures failing their save are sickened in addition to being shaken and the effect lasts for 1 minute. Creatures that witness you engulfing/smothering targets must save or be frightened. -Exorcising Mutilation: Con damage is reduced to 2 and rerolled save nets +1/2 mythic tier to the roll. Also allows you to expend mythic power to instead suffer regular damage when using the feat. -Exsanguinate: Gain mythic power instead, up to mythic tier in a 24-hour period. Also lets you use mythic power to blood drain while not pinning the target. This is insanely powerful, borderline broken. Mythic power should not be regained so easily. Also can be kitten’d. Just uncharacteristically bad for the author. -Fear Eater: Gain temp hp equal to tier when transferring a fear effect to you. For mythic power expenditure, you get a save with a tier-based bonus. -Fleshcrafter: Expend mythic power after resting to accomplish 8 hours of fleshcrafts. Also automatically lets you succeed Heal checks to apply or remove fleshcrafts and they aren’t destroyed from removing it. Minor note: The feat has a type “elicir”. -Ghost Guide: Numerical escalation and when you gain the completion benefit, you gain the mythic versions of call haunt, speak with dead and speak with haunt. Cool! -Gruesome Shapechanger: Increases the Acrobatics DC. Creatures that view your transformation and fail their save are sickened for 1 minute as well as shaken. If you expend mythic power, you upgrade shaken to frightened if the target fails the save by 5 or more. -Horrific Gorging: Consume any type of creature type, thankfully with a GM-caveat that prevents the abuse via kittens….at least in that way. You can get infinite temporary hit points, though – or at least,a minor shield of them, as you get temporary hit points equal to twice the tier. It’s not bad to eat a ton of kittens that way, but yeah, HD-caveat would have been nice. When swallowing mythic creatures, you can use mythic power to render targets frightened. -Incorporeal intuition: Eliminates the adjacency caveat and increases the range to 10 ft. per tier and you suffer no penalty when identifying targets thus via Knowledge. When you sense a target, you can use mythic power to determine starting attitude of the critter, as well as the strength (based on aura-like categories). Cool! Editing and formatting are pretty good, I noticed no significant hiccups. Layout adheres to Legendary Games’ two column full-color standard and it features the artwork on the cover; that’s it – the one page content is solely devoted to crunch. The pdf has no bookmarks, but needs none at this length. 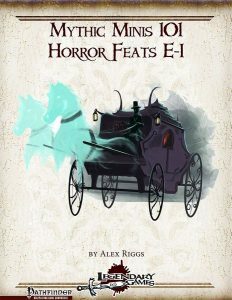 Alex Riggs’ third collection of mythic horror feats has some nice ones, but also a couple I am less enthused about; As a whole, I consider this to be a mixed bag, slightly on the positive side. My final verdict will clock in at 3.5 stars, though I feel it’s closer to 3.